-Combine lime juice, soy sauce, 2 tablespoons honey, and chipotle in a large bowl. -Add chicken, and toss well to coat. Let stand for 10 minutes at room temperature. -Arrange the chicken on a broiler pan coated with cooking spray, reserving marinade. -Bake at 400° for 15 minutes. Place reserved marinade in a blender, and process until smooth. -Place pureed marinade in a small saucepan. Bring to a boil, and cook 3 minutes. -Brush chicken with half of cooked sauce; return to oven and bake an additional for 10 minutes. Brush chicken with remaining sauce; bake an additional 10 minutes. This is another recipe I saw in a Rachel Ray magazine (I'm working through my stack of ripped out recipes) and I LOVED this! The flavors were great and reminded me of dishes I ate in Uganda actually. Although the girls weren't big fans, Mike and I both thought it was really, really good. I made a little rice to go with it too and the extra sauce on the rice was DELISH! The chicken shreds apart like it has been cooked in the crock pot and I love potatoes with any meal...definitely a keeper :-)! 1.In a large skillet, heat the olive oil over medium heat. Season the chicken with salt and pepper and add to the skillet. Cook, turning once, until golden, about 5 minutes; transfer to a plate. Reserve 2 tablespoons oil in the pan. 2.Using a food processor, puree the onion. Add to the reserved skillet along with the garlic, scraping up any browned bits. Puree the red pepper and add to the skillet along with the cumin and bay leaf. (I don't have a food processor, so I put the onion and red pepper in my blender with some of the tomato sauce to puree it)Increase the heat to medium-high and stir in the potatoes, tomato sauce and 1 cup water. Lower the heat, cover and simmer for 10 minutes. 3.Add the chicken, skin side up; cover and simmer, stirring, until the chicken is cooked through, about 30 minutes. Discard the bay leaf. Top with the cilantro. After not eating Mexican food for a whole week, I really needed some :-)! I saw these new enchiladas posted on My Kitchen Cafe and couldn't wait to try them. Enchiladas with sour cream sauce are one of my favorite things to order at Mexican restaurants so I was really excited that these had one. They were very, very good! Although the beans were really good in them, I think next time I'll leave them out so they have a more restaurant flavor to them. We'll definitely be making these ones again!!! -In a medium bowl, combine the softened cream cheese and green chiles. Mix well. Add the chicken and black beans. Mix to combine. Set aside. -In a large nonstick skillet, melt the butter over medium heat. Add the onion and cook, stirring occasionally, until the onion softens and starts to turn translucent, about 3-4 minutes. Sprinkle the flour over the onions and stir well. Cook for 1 minute, stirring. Slowly whisk in the chicken broth and milk. As you whisk and the mixture cooks, the flour will get less lumpy around the onions and the mixture will become smooth. Cook over medium heat until the mixture is bubbling and has thickened, about 4-5 minutes. Remove the skillet from the heat and stir in the enchilada sauce and sour cream. -Lightly grease a 9X13-inch baking dish. Spread about 1/4 cup of the sauce on the bottom of the dish. Fill each tortilla with about ½ cup of the chicken/cream cheese filling. Top with a small handful of shredded cheese, a couple tablespoonfuls for each enchilada. Save at least 1/2 cup cheese for the top of the enchiladas. Roll the tortillas up and place seam side down in the prepared baking dish. Continue filling enchiladas until the dish is full. -Pour the white sauce over the top of the enchiladas. Top with remaining cheese. Bake for 20-30 minutes until the enchiladas are bubbling, hot and lightly browned. Sprinkle fresh cilantro over the top and serve. This Rachael Ray recipe is my new favorite. I am in love with it and couldn't stop eating it :-)! I wish we had leftovers, because it is sounding awfully good again right about now. I made an extra dish for a friend, I didn't double the mushrooms and chicken (just divided the 10 oz between the 2 dishes and used 3 cups of chicken divided between the 2) but doubled everything else. 1.Preheat the oven to 350°. In a large skillet, heat the butter over medium-high heat until just melted. Add the mushrooms and cook, stirring occasionally, until softened, about 5 minutes. Sprinkle the flour on top and stir in for 1 minute. Stir in the marsala and cream and simmer, stirring occasionally, until slightly thickened, about 3 minutes. Stir in 2 cups water, the parsley, 1 teaspoon salt and 1/2 teaspoon pepper. 2.In a greased 9-inch-by-13-inch casserole, spread the rice in an even layer; top with the chicken. Pour the mushroom gravy on top. Cover snugly with foil and bake until bubbly, about 35 minutes. Discard the foil, sprinkle the parmesan on top and bake for 5 minutes more. This recipe comes from teh May 2010 issue of Cooking Light. It is a perfect summer dish...nice and light and easy and cool. And can I just say that making my own Ricotta cheese was SO easy and I felt like quite the cook, or pioneer, but either way very accomplished :-). The girls weren't fans of the tomatoes but both wanted seconds of the pasta and zucchini. It would be great with some grilled chicken thrown in the mix too! 1. Combine milk and buttermilk in a small heavy saucepan over medium heat; bring to a boil, stirring occasionally. Remove from heat; drain. Place milk solids in a small bowl; sprinkle with 1/8 teaspoon salt. Toss gently to combine. 2. Bring 6 quarts water to a boil in a large Dutch oven. Stir in 1 tablespoon salt and pasta; cook 7 minutes or until al dente. Drain. When I saw this recipe on My Kitchen Cafe I knew Mike would LOVE it, so I decided to give it a try. The meatballs are sooo good! And of course, in combination with the melted cheese and homemade bread, it makes for one delicious sandwich. She advises using the recipe for french bread rolls and shaping them into more sub-like rolls (which I need some practice on :-). The only problem I had was there were WAY more meatballs than rolls, so double the roll recipe, and you have enough meatballs to make about 10 sandwiches. *In a large bowl, mix all of the meatball ingredients together EXCEPT the meat. Let the mixture sit for 10-15 minutes so the breadcrumbs/crackers can soak up the liquid a little bit. Add the meat and mix well with your hands until all the ingredients are combined. *Preheat the oven to 400 degrees. Line a rimmed baking sheet with aluminum foil and lightly grease the foil. Form golf ball-sized meatballs and dredge them in the flour until lightly coated. Place the meatballs on the baking sheet about one inch apart. Bake for 20 -25 minutes until the meatballs are completely cooked through. *Combine the sauce ingredients in a medium saucepan and bring to a low simmer. Simmer for 10-15 minutes on low. Keep warm until the meatballs are finished baking. *To assemble the sandwiches, slice the buns in half. (If desired, lay the buns flat open on a baking sheet and top one side with cheese – toast in the oven for 4-5 minutes at 400 degrees until the buns are toasted and cheese is melted.) 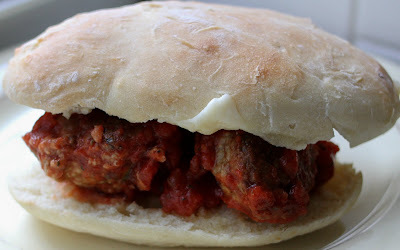 Place 3-4 meatballs on each bun and top with desired amount of sauce. Serve immediately with lots of napkins.